Join us as members of the Beginner and Intermediate programs of our Children & Youth Arts program join forces to present Disney’s Cinderella KIDS! The timeless fairy tale becomes a new audience favorite in Disney’s Cinderella KIDS, an adaptation of the treasured animated film geared toward young performers. Poor Cinderella is endlessly mistreated by her wicked stepmother and stepsisters and denied a chance to go to the royal ball. With a little help from her mice friends, and a lot of help from her Fairy Godmother, Cinderella’s dreams come true. She goes to the ball, meets the Prince, and falls in love! 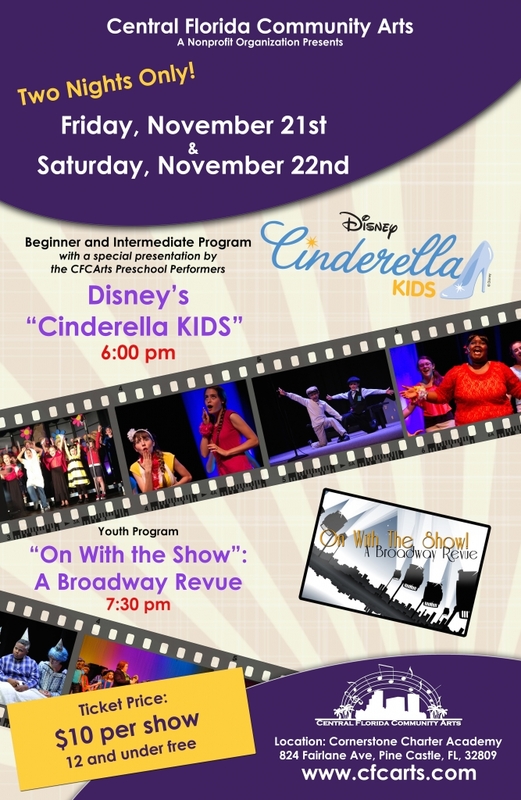 Disney’s Cinderella KIDS will be presented at 6:00pm on Friday, November 21 and Saturday, November 22, in the auditorium of Cornerstone Charter Academy, 824 Fairlane Avenue, Pine Castle, 32809. General admission tickets are $10 and children age 12 and under will be admitted free. The show will also include a guest performance by the CFCArts Preschool Music program!